Got my author copies yesterday! The book will be on the shelves soon. You can preorder it now on Amazon cheap. Or you can "support your local bookstore". 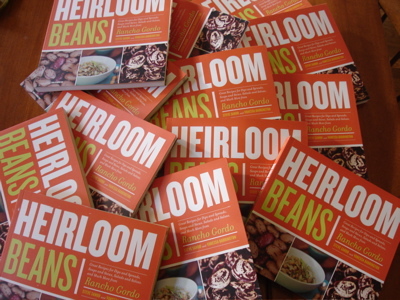 I'll be teaching a bean class at Sur La Table on Maiden Lane in San Francisco September 13. We'll be hitting the Ferry Plaza Farmers' Market to meet Steve, talk beans and buy ingredients, then we'll head back to the kitchen and prepare a variety of bean dishes. Steve and I will both be at Jimtown Store on September 14th from 2 to 5 signing books. I'm teaching in Cleveland October 20, 21, and 22 and then at Kitchen on Fire on the 25th. This entry was posted in Books, classes. Bookmark the permalink. Post a comment or leave a trackback: Trackback URL. Henry and I made the cranberry bean gratin again tonight with some modifications for what we had in the fridge (bacon, broccoli rabe), and it was delicious. But the best part is that Henry loved the beans so much he ate them straight out of the pot with his fingers. Hope the signing went well, and thanks for keeping us inspired to never eat anything that’s not delicious. Congrats on the book! Can’t wait to see it. Baily, Yay! Start them young. Amy, thanks! I look forward to participating in the Hunger Challenge with you. It seems like we should have met as we travel in such similar circles. I’ve long been a fan of your blog.